Thanks for stopping by for another Challenge from The Critter Sketch Challenge Blog! We're glad to see so many of you playing along in our weekly challenges. This week we have a sketch for you created by Kelly Haberstroh - the sketch is to create a Pocket Card. The base of my Pocket Card is Not Quite Navy, layered with Kiwi and some pretty pattern paper from October Afternoon. 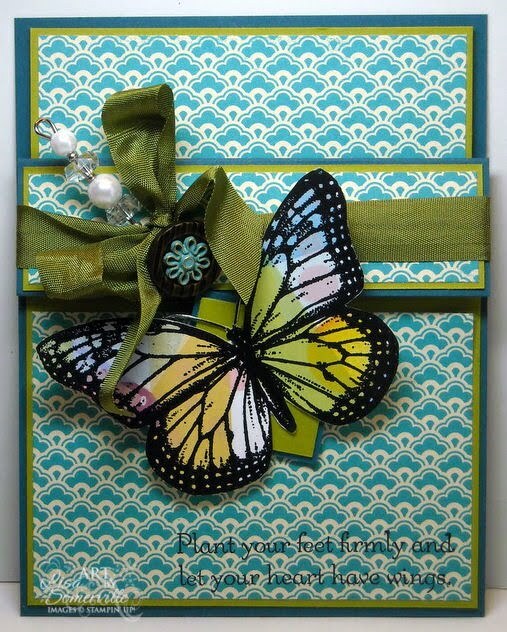 The Butterfly from Stampin' Up! 's Wonderful Wings (retired) is Stamped using the Geometric Overstamping Technique from a past issue of the TJNL. To embellish my pocket card, I added some Seam Binding, Button from Tim Holtz and a Stick Pin. This card also fits Gingersnap Creations Chestnut Theme Challenge - Wings. Don't forget to CLICK HERE for your chance to win some Blog Candy! Remember there are no vendor restrictions to play along with this challenge. By entering this months challenge, you have a chance to win a prize donated by Soft Pencil. Looking for more inspiration using this weeks challenge, check out the Critter Challenge Blog for more details and to see what the other Designers created this week. Very pretty...I love that DP!!! Beautiful card, luv the embellies! Lisa, OMG this is gorgeous! Your butterfly is simply beautiful, great DP, love your card. wonderful Lisa - I love it! Breathtaking butterfly! Love the embellishments!! Wow! That butterfly is amazing. Great job! 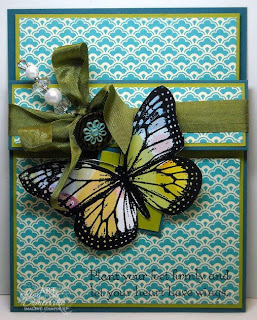 This card is just lovely...the colors, the butterfly, everything! ...thank you for your sweet words. I turned bright red when I saw the pin! That was really sweet of you! The colour combo with the OA DSP, great use with the pin. I have just started dabbling with using pins as embellishments. SUCH a pretty card Lisa!!! That butterfly looks gorgeous with those fab papers!! Love it! Lisa, this is just over the top gorgeous! I love that butterfly and what a great technique! Also love your DP. What a beautiful design, Lisa...such pretty colors and I love that awesome butterfly!!! beautiful butterfly! I love the color combination too! Gorgeous. Pretty butterfly and the colours go so well with the dp you've used. Such a pretty card Lisa! I love that beautiful butterfly! Fantastic! Love your butterfly and the way you embellished the card. I love this card, that butterfly and the pin!!! Beautiful!!! Love the PP you used in the background and the hat pin with the card is so very pretty. Lisa, this is stunning, I love the overstamping technique, beautiful! Beautiful card! Thanks for playing the Gingersnap Creations Wings Challenge!